"Piano is very fun and it is good for my brain. I would like to be in a concert and get an award. I like to be the only person in my family who knows piano. I would like to be in piano tournament. And I'm getting good at it and I like that Jason teaches me, he is a good teacher and he's sweet and he is good at piano. I even like piano better than soccer and chess and gymnastics." "...I like Ballard Academy I love it so much and it is wonderful and beautiful there with a stage I get to go on and a room I get to play in and each girl gets to go and its really fun doing ballet because I like and love it so much it is just so Beautiful doing it and I didn't quit it. My teacher is named Veronica, she teaches me wonderful ballet. She is a really great teacher. I like the prizes, some days I get tokens and some days I get stickers and some days my mommy or daddy bring me ballet and waits for me, it's the grownups get to watch me...I like ballet"
"Taking dance lessons is important to me because it's a skill I've wanted to learn for a long time. The Ballard Academy of Music and Dance is the first place that I have ever taken dance. It's making me feel like dance is great -- which it is :) ... I love the idea of small dances leading up to performances. Most of all, when we do dances I feel confident and free. Also graceful, even if it's hip-hop or jazz. While we are doing them I feel that I can do almost anything, and it energizes me. When I go home, I am glowing as I practice the dance we did that day. I love that feeling." "Studying dance at the Ballard Academy is importnat to me becasue dance is my passion. Being able to utilize my passion here means a great deal to me. The instructors are incredible. I have learned so many new moves and terms, I have also improved so much since I have started dancing here...There is always a struggle with fulfilling dreams, you just have to learn to overcome them. Like my teacher always says 'That was good! Now do it again.' After studying dance at the Ballard Academy I can take that positive attitude with me wherever I go." "I ♥ class because...I like to spin across a smooth floor and to learn lots of notes and melodies galore! Twirling, swirling, working all day. Giggling, dancing hip hop hooray! I wish I could go every day! I like to chat and work all day. It is fun to spin around, even better than play! It is fun to dance and spin all day!" "I put on my headphones, close my eyes and immerse myself in the stream of emotion called music; this is a ritual I have performed many times in my life. When lonely, I might listen to Kevin Cronin’s love song to the weathering in Lightning. When sad, Pat Benatar pours out her pain and regret for a marriage gone bad in Precious Time. I hear it in her voice and the guitar’s first mournful, slowly-descending note. When I seek nurture and validation, Uriah Heep’s Lady In Black reminds me that I am not alone and that when I need comfort, the Mother of all Men is never far away. Music means many things to many people. But to me, it is the language of emotion rendered in sound, and it is very powerful. I do not remember a time I did not love music. My first recollection of a song I can name is listening to Hey Jude on my uncle’s radio. The Beatles were not yet my musical friends, but they became so later. The radio was my portal for acquiring many new friends. i remember, like so many people, trying to decipher the rich lyrical texture of American Pie, a song Don McLean claims later to have regretted writing. How sad for us had this been true. I was mesmerized by Stairway to Heaven; it was a beautiful integration of acoustic and electric guitars adorned with darkly ambitious lyrics. Twice in my life I was a DJ, spinning discs for myriad youth celebrating joie de vivre. As Neil Peart notes in Limelight, he is locked in a gilded cage. And I sadly, am locked out. We will never meet, he and I, but we are musical friends. My yearning to be able to participate in music led me to purchase a guitar, and then a second. My singular efforts were feckless and the secrets of the instruments remained hidden from me. After ten years of no success, I finally decided to overcome my inhibitions and reach out for help. I contacted the Ballard Academy of Music and Dance and asked if they though they could teach a blind man to play the guitar. They could, they claimed, and thus began my musical odyssey. In Prime Mover we are reminded that anything can happen and that the point of a journey is not to arrive. This is important for us beginners to remember. At first it was teaching fingers to land at the right place at the right time. Then meaning was assigned to why the fingers should land just so. There are scales aplenty and chords to match. They don’t all sound beautiful, but each is a tool in the musical toolbox. After three years I cannot claim to have arrived. In fact, if life has taught me anything at all, it is that education never ends. To my fellow sojourners I wish you joy. To those who have not yet taken that important first step, I offer you courage, to this writer, who lives a life of dispassionate rationalism, I call blessed the day I placed my first foot on the path to learning the guitar at the Ballard Academy." "Studying dance at the Ballard Academy is important to me because I love ballet, ballet is a sport. It can help your body when your body is tired or out of shape. It has lots of stretches, and steps. Some are fun, some are slow and some are hard. I like to practice every day after school, and practice makes perfect. I feel happy and excited when I dance. I like all the nice teachers. They are so nice, that’s probably why you have so many kids. 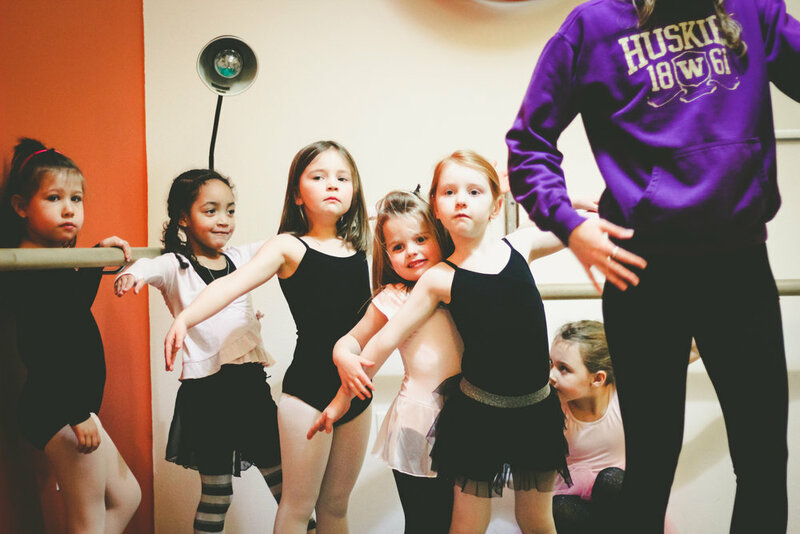 I also like the Ballard Dance Academy because there are so many classes that you can do!" "Dear Colt- Thank you so much for being such an awesome teacher! I'm really looking forward to coming back next year!" Ballard Academy of Music and Dance has been a great place for me to get back into dance. It was hard to find a studio that offered classes for adults, but was still casual. It has been fabulous to find a spot in my neighborhood, where I can meet others, and get back into something I love so much. The adult classes are perfect for anyone, they are small in class size, and are offered at good times. I have been taking classes since this summer and take both the Modern and Ballet class, and love that the classes really do target all skill sets. Anyone could feel comfortable here, whether you are like me, and getting back into an old hobby or if you are wanting to try something new, and have no experience. - The space is great... basic, clean, and a great location! - The studio cares about all their clients! Such a great addition to the neighborhood! My 9yo son and I take joint guitar lessons from Clark since maybe 4/10. Clark is an awesome teacher and we both like him a lot---to the point where my son wants to emulate his playing style. I have some prior experience with guitar but this is my son's first time playing. We've both made a lot of progress and love being able to play and practice together. The Academy is run by professional staff and is a fun, clean, and lively place to learn. I've been taking guitar lessons at Ballard Academy with Colt Valenti since April 2010. Colt keeps the lessons interesting and quickly zeros in on problems with technique, style and so on. He also does a great job of explaining as much or as little music theory as necessary. The academy itself is nicely laid out with smaller rooms for private lessons as well as larger ones for groups. The large dance area is also well designed. I would recommend anyone interested in music or dance to take lessons here. Our son has been taking guitar lessons from Colt for about 5 years. Colt does a wonderful job of keeping our son excited about music, and has easily adjusted with him as he's gotten older. He comes out of his lesson excited, and proud, every week! Regular recitals, new challenges, continual growth - it's all we could hope for as a first experience with music for our son! My son is taking the intro to music class they offer here. At first he was a little unsure about taking music, but now he is taking a genuine interest in music and gets really excited to go to class. He talks nonstop about the things he learns and I find him browsing through the guitar books in the lobby with high interest when we come on a different day for his sisters dance class! I would highly recommend the intro to music classes to any parent who wants to introduce their child to music. Its a great way to let them learn and explore different instruments and rhythm in a small but fun group setting before putting them into private lessons. We love the dance classes too! My Son is even asking if he can maybe try one out now. I never thought he would ask that! My 13 year old son has been taking guitar lessons from Judd since Ballard Academy of Music and Dance opened. He looks forward to his lesson each week and has fun picking some of the songs to work on. Judd is a patient teacher and makes learning guitar fun for kids. I am glad to see my active son showing so much interest in music! Great place for kids to learn music and dance! Ballard really needed this. My son is 3 and loves his music class so much that he skips to the door every time and talks about what he learns all week. We are looking forward to many years of lessons and classes. I am also looking forward to taking some lessons there in the future. I'm what you would call a "mature" dancer. Limited flexibility, creaky bones, some muscles not used for many years. What was I thinking signing up for a dance class?? But I'm so glad I signed up for the Adult Modern class at Ballard Academy. The pace of the classes is just right and the instructors understand the strengths and challenges for older dancers. The Academy has provided me with the opportunity to stretch out of my comfort zone (RECITAL), and still have a great time. I feel like I'm doing something good for myself when I come to the Academy. The facility is really great, and Lacey and Colt are always very warm and welcoming. My daughter enjoys the resident Labradoodle, Bruno! Thanks, Lacey and Colt, for opening the Academy -- keep up the good work! Taking guitar lessons has improved my quality of life. I would suggest lessons for anyone who plays an instrument and would like to get better quickly. I can't think of a better place than Ballard Academy of Music and Dance to do it. Thanks for the great class, the smooth communication and payment, and the friendly faces every week. We really enjoy your studio! I have taken guitar lessons from Colt for over two years, first out of his home, and more recently at his new school in Ballard. Colt has the rare gift of being a great performer as well as teacher, and infuses the joy and passion that he feels for music into his teaching of others, and now with the school, he has the ability to spread that joy to even more people. The facility is very well thought out, and is exceptionally welcoming for the students. I recommend it to anyone looking to learn music or dance. My 9-year-old and I have been taking "joint" guitar lessons - mostly geared toward my son - from Colt Valenti, one of the owners, for nearly two years. The lessons are always excellent, and my son has fun but learns a great deal, and looks forward to the lesson. He is generally a bit shy but has been well prepared for his recitals, each of which has been a positive experience. The school has a great layout and nice space for lessons, and since the facility is brand new naturally it is clean and welcoming. All around a great place to learn. Isaac just loves Mondays because of guitar and often reminds me of the time so we won't be late. Thanks again for sharing a bit of your talent and time with him. Not quite sure how to start or what to say, excepting 'THANK YOU!'. Thank you so much Colt for enabling Keshav to grow with his music. Thank you for helping Keshav come this far. I have only been telling him for ages to sing and I thought he was ingoring me. I am truly impressed with with you Colt, (of course with how far Keshav has come too). Thank you for inspiring him and teaching him to be who he is, especially with his music. Hoping to see you soon again and discuss his Senior recital too. Take care, and thanks a ton again.